The most important, and often overlooked, aspect of packing for a lengthy road trip is to make sure you have plenty of musical instruments for your kids to play. We got ’em packed, and boy did we hear them. We left the house this morning at 6:03 a.m. Then we left the house again at 6:08 a.m. after a return trip when we realized Miles, age 14, forgot his spending money. The first few hours of any road trip is very exciting. The trip is full of promise, and nothing has gone wrong yet. Everything was perfect this morning until Mallory, age 11, told us she was going to take a picture of herself at every stop, then realized she didn’t bring the power cable for her camera. And the camera was already dead. Mallory persevered though. She kept us entertained by blasting music from her iPod. Before the sun even came up, Mallory had the Party Rock Anthem playing while Marissa, age 8, would bang her new light-up shoes on the floor to the beat. We had a night club on wheels complete with flashing lights and loud music. Our van rolled into Chandler an hour later where we met up with my folks, KK & PK, my brother Scott, and his wife Erin, and my Uncle Joe & Aunt Judy. 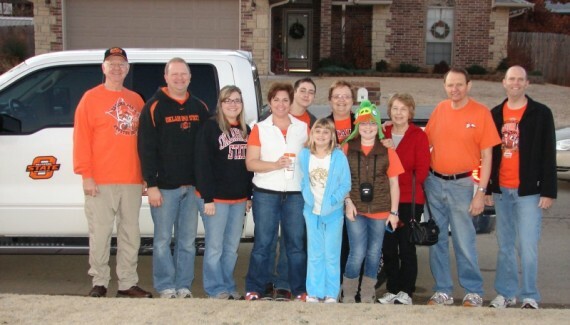 Together, we formed a formidable traveling group of 11 Cowboy fans ready for the Fiesta Bowl in Phoenix, Arizona. Scott had cooked up an enormous batch of monster cookies the day before, and very generously endowed each one of the three vehicles in our caravan their own supply. That, along with a refill of our coffee mugs, was all we needed to hit the road. We made our way through Oklahoma City, where there is a skyscraper under construction that dwarfs the rest of the downtown. I don’t make it to OKC very often, so it is still surprising when I see that. We also got to see the new outlet mall west of OKC. That outlet mall is a source of conversation, even in Tulsa. Our initial destination was Amarillo, Texas, for lunch. 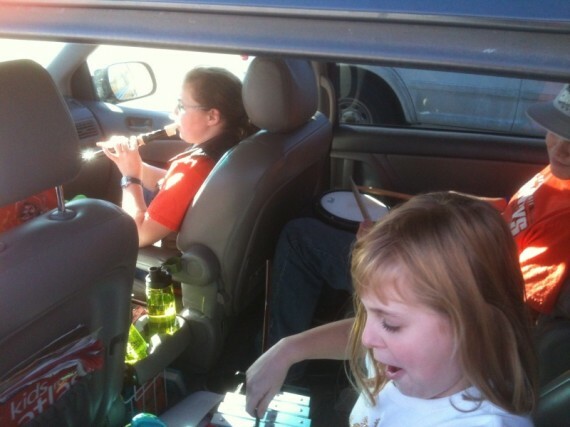 That drive allowed for plenty of time to break out the musical instruments. 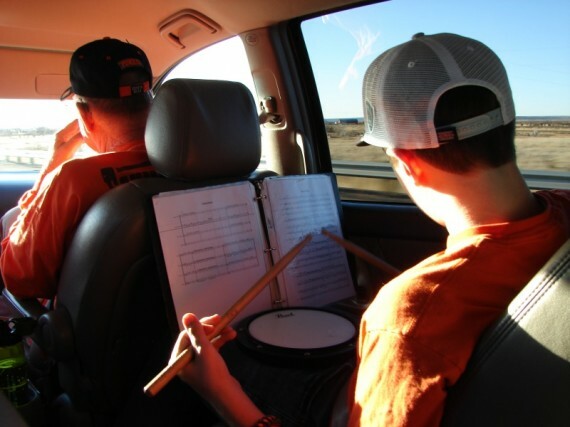 Both Miles and Mallory take percussion at school, so we had a drum pad and a set of bells in the van. And just for good measure, a recorder. Miles spent a good chunk of the morning working on his drum pad. This is a great instrument because it is not very LOUD. 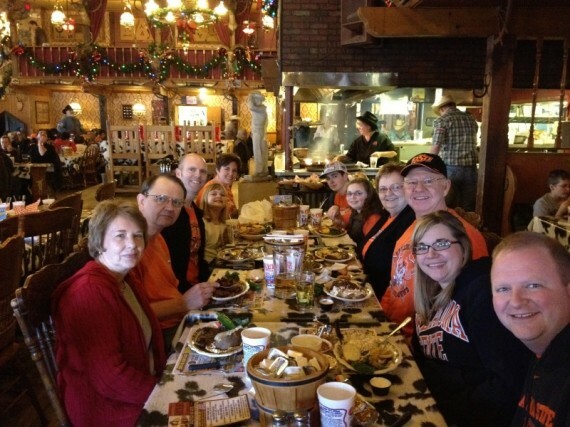 Lunch was at one of our all-time favorite places – the Big Texan Steak Ranch. Miles honestly gave their 72oz Steak Challenge serious consideration before deciding against it. Probably a wise decision. 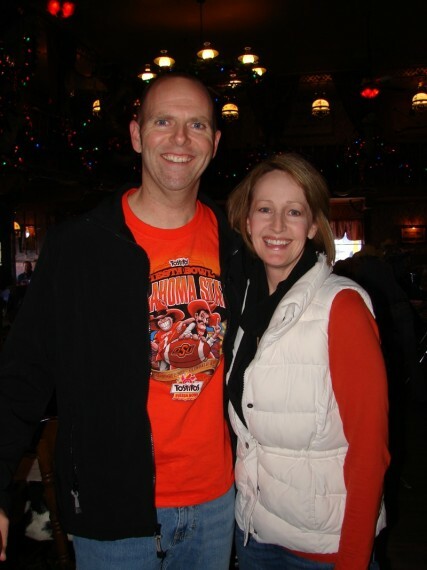 We were not the only pack of Oklahoma State fans at the Big Texan. There were several other tables represented in orange, enjoying their lunch. A group this large means only one thing - an automatic gratuity. We had not been seated very long when I had a tap on my shoulder. I turned around and it was a high school classmate of mine that I have not seen in probably 10 years. Of course, we would run into each other in Amarillo! Is there anyone sweeter than Nancy? I don't think so. That's why I insisted on taking my picture with her. 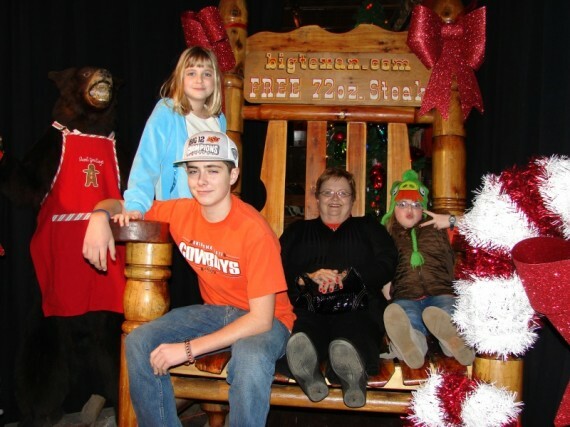 I am normally quite enamored with my experience at the Big Texan, but was disappointed today. My steak was subpar and the service was worse than that. But I will say that plenty of others in our group had a great meal. Don’t worry Big Texan, we’ll be back. Before we hit the road, we stopped for fuel. Evidently, the kids were energized by lunch as all three instruments came out and we were serenaded by their melodious tunes. Given the brilliance of their music, you would have thought my Mom or Dad or brother would want to ride in our van. That was not the case. The kids were wound up, but in a good way. 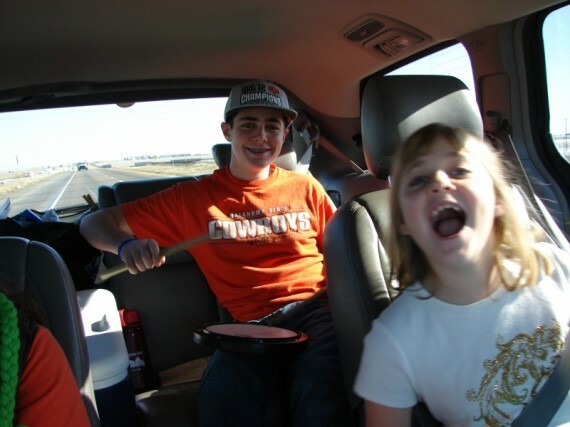 We spent much of the time between Amarillo and the New Mexico State Line with Miles playing a drum beat while Mallory, Marissa and I took turns rapping. The highlight of this stretch was definitely the drum beat. In an exciting development, when we stopped at the New Mexico Information Center, KK traded places with Mallory in our van. Nothing against Mallory, but that was a good trade! My Dad gets excited about bowl trips. One of his happiest days of each year is the Saturday that the Cowboys get their 6th win, thus assuring a trip to a bowl game. His enthusiasm in the days leading up to our departure today has given the whole traveling party a boost. We could count on an email about roughly every 6 hours providing us an updated countdown to our trip. Miles continues to practice on the drum pad. Dedication! KK and I were able to visit for several hours. We both expressed our appreciation for the fact that our family has the opportunity to take trips like this, and that we enjoy each other’s company. It is a blessing! We pulled into Santa Rosa, New Mexico just as the sun was fading. There was a shared feeling that what this group needed was a Dairy Queen stop. 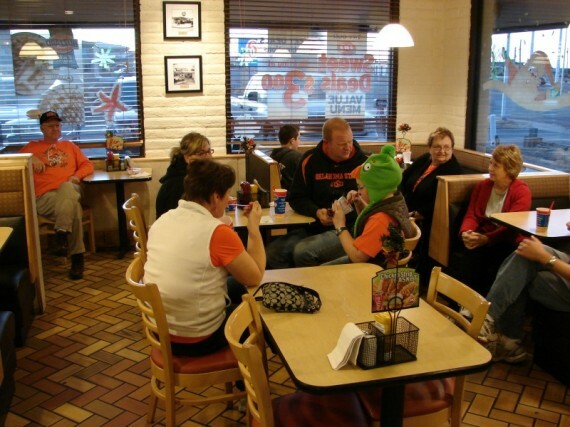 Our party took over half the seating at the Santa Rosa DQ and made ourselves at home. We did that until a busload of kids showed up, which we took as our cue to head out. This DQ was barely able to hold all of us. 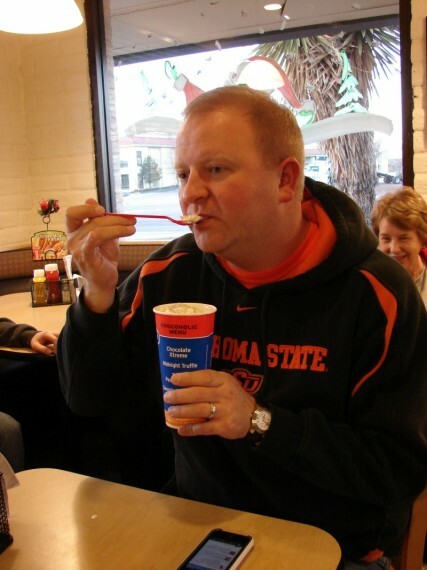 Nobody takes DQ etiquette more seriously than my brother. Check out that pinkie! Once the sun went down, the energy level seemed to go up in our van. Stephanie was camped out in the 3rd row while Mallory rode shotgun next to me. The rapping continued. Mallory paid Miles the ultimate compliment by telling Stephanie “he lays down a sick beat”. We rolled into Albuquerque around 7 p.m. I am glad we arrived after dark, because this town likes to light things up. As you descend through the final mountain pass into town, there is an oversized cactus(?) on the side of the road that glows different colors. Green, then blue, then red. I’ll bet it causes lots of accidents. Once in town, many of the overpasses and retaining walls were lit up in various colors. This was obviously lighting that was unnecessary, but I loved it. Good job, Albuquerque! We checked in at the Monterey Non-Smokers Motel near Old Town. We stayed at this very motel 3 years ago on our way through New Mexico. The motel has a European flavor to it, punctuated by the desk clerk who was very obviously from Europe. He had a great rapport and we were all laughing in the small lobby while checking in. Arriving at our destination by 7 p.m. is not something we are accustomed to, but we’re not against trying new things. 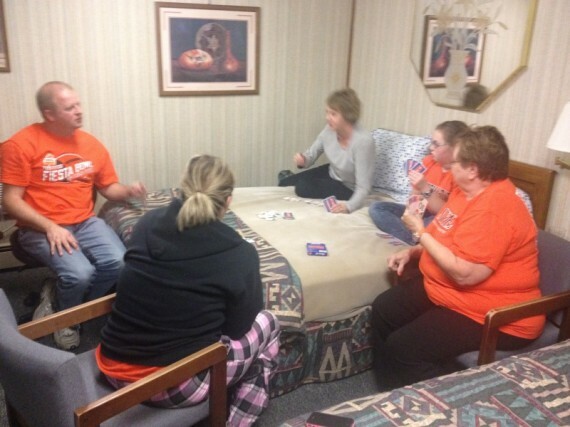 A Phase 10 card game broke out in my parent’s room that involved half our group. The rest of us kicked back and went straight into relaxation mode. Fun 'n Games at the Monterey Non-Smokers Motel. Plans were made for tomorrow, and we have intentions for hitting the road at 7 a.m.
We aren’t coming to the game so are mentally on the trip with you and will be yelling loud for our Cowboys.